Sonoma County Emergency Services officials say the systems they use to alert residents of disasters have significant issues, nearly a year after the deadly Northern California wildfires prompted criticism about how the county alerted people to the dangers. The county conducted a test of several alert systems last month and their newly released After Action Report found serious problems with them. "There is no guarantee at this point that we can get [messages] to everybody at the right time," said Christopher Godley, Sonoma County's Interim Emergency Manager. In the test, SoCoAlerts, which is an opt-in system that sends messages to landlines, cellphones and emails, successfully delivered the test message to a person or an answering machine 51 percent of the time. 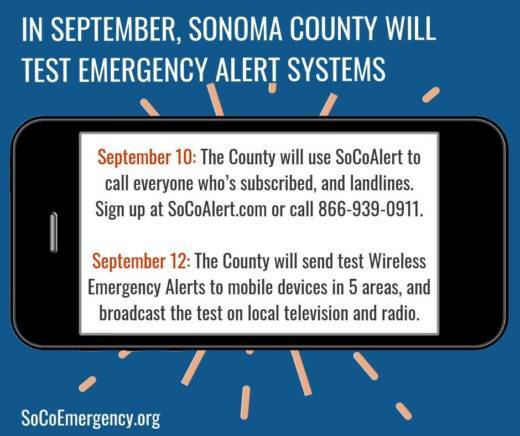 The county did find that the publicity leading up to and after the test increased the number of people subscribed to the SoCoAlert system by more than 30 percent. The county also tested the federal Wireless Emergency Alert (WEA) system, which is commonly used for Amber Alerts. The report found that different cellphone carriers sent the WEA either too widely (AT&T) or not widely enough (Verizon). The report says these differences cause "significant issues" and make it "challenging for emergency management officials to target specific areas with confidence." It urged local officials to work with state and federal representatives to improve the system. Godley says the county will have to rely on a combination of all of these systems, as well as community awareness and cooperation, to effectively communicate during an emergency. "As good as these technologies are it really does come down to people communicating and supporting each other," Godley said. "We find that's the best way to ensure that everyone gets the message." The state Office of Emergency Services found problems with the county's alert system in a February report, but said it was not yet ready to comment on how this report addresses those issues. The test also asked for feedback from the public, which the county says it will use in crafting its improvement plan, which is due out later this month.